I promised I would make introductions! I've been quilting a long time but last fall, I became obsessed! 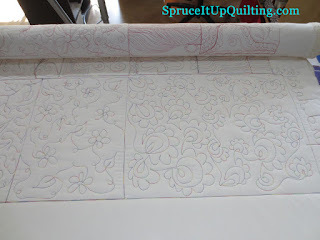 I was on a mission to get lots of quilting done not only for gifts but also as a means to pass the time! You see, work outside the home was becoming less and less satisfying and I could see the end of my professional career getting closer. I've always been a firm believer in the saying: if it's no longer fun to do what you're paid to do then it's time to quit! Work was no longer fun and it was time to change gears. 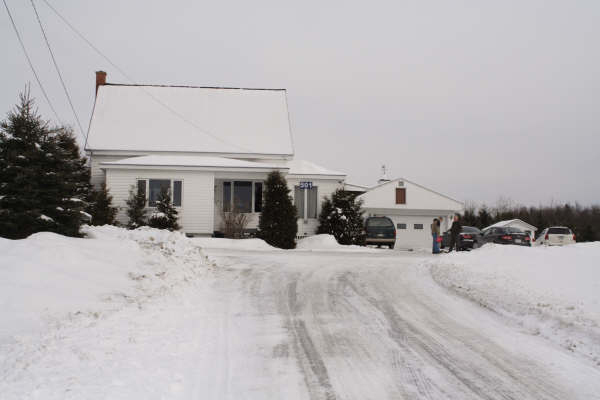 January 2013... another death in the family! UGH!! Our father passed away January 2006 after a few years of dementia. 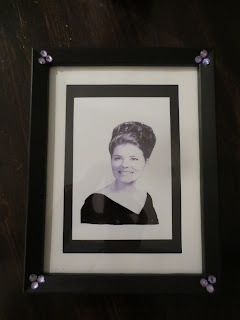 This time it was our sister, the oldest of 5 girls, at age 66... such a shock! Cerebral aneurysm rupture aka: hemorrhagic stroke! 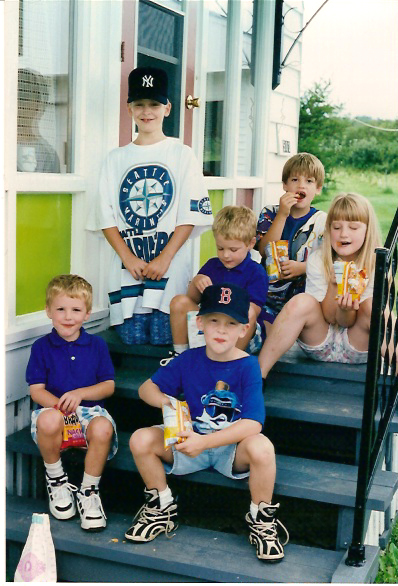 None of us got to say goodbye! It still hurts! Fast forward to March and a new beginning! After losing my sister, I decided it was time to concentrate on what I wanted to do, what was fun to work on and what I NEEDED to do for myself and my sanity! Retirement! I'd been dreaming of having a longarm for years and never thought I would be so lucky to own one! Then I saw a listing on Craig's list! A lovely lady in So Cal. put up her longarm quilting machine for sale and asked interested persons to send her an email with their phone number... I answered that call 15 mins after I emailed her. AND BINGO!!! I was the lucky one! It was now or never! This was Lolah's previous residence! 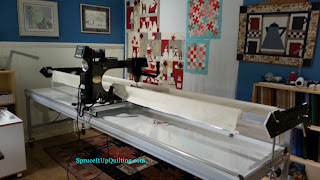 There she was in this family room full of quilting supplies! 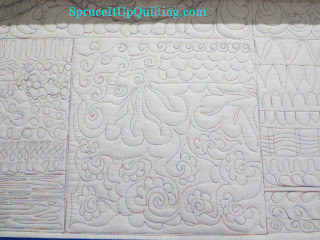 Her owner was cleaning her "studio" and was getting rid of all her quilting supplies! YUP! She was done with quilting!!! MY LUCK!! Lolah had been well cared for, had low hours of use and came with lots of extras. It was promised that she would stitch beautifully.I even bought all her thread and some rulers. 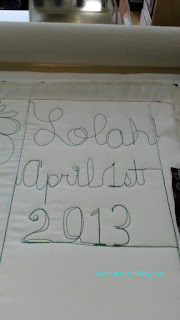 April 1st... Derryl, the Gammill technician for the local dealer called to ask if I was ready to receive Lolah... a whole day early!! Of course!! This is Lolah in her new home. She's a Gammill Premiere Plus. I ordered her an extended plate for ruler work. As Derryl's suggested, I also ordered some new wheels to make her glide across the bed without resistance. 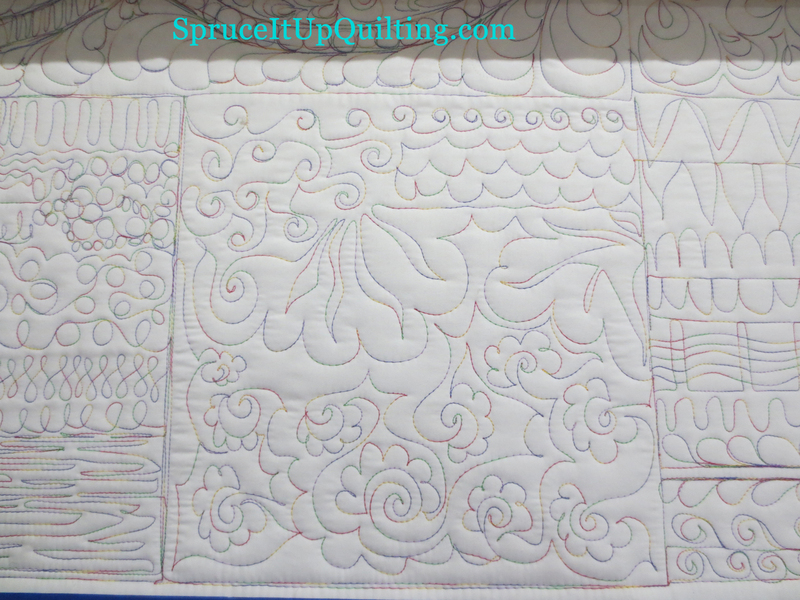 Someday I will get the hang of pantograph quilting! In the meantime, I'm having fun with her. The only stress I feel now is when I load her up with a new quilt! YIKES!! what shall I quilt on it??? 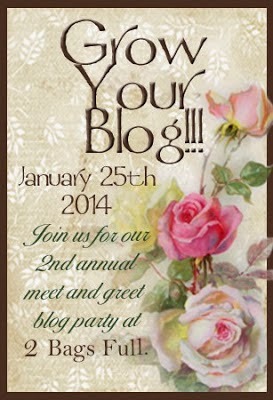 I've been following "crafting" blogs for a long time "behind" the scenes. I admire all of you and the work you produce! Sometimes I would post comments but most of the time I would just sit and admire everyone's creativity at work longing to be able to accomplish so much in what seemed like so little time. Where do you all get sooo much energy? How can you finish so many projects sooo quickly? You must work all day and night to get things done! I soon learned about WIP! Who doesn't have projects waiting to be tackled? 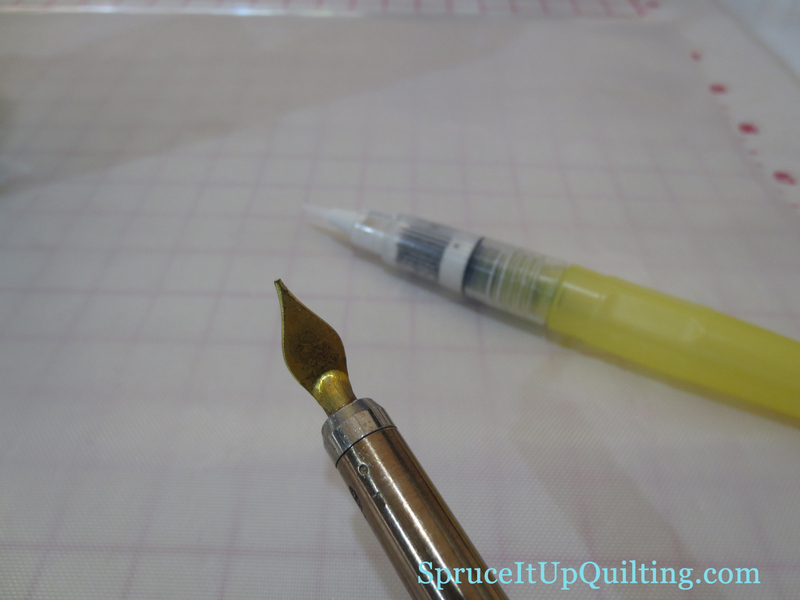 If you're a crafter, quilter, scrapbooker, etc, you have several of these on the go at any given time. And if you don't, you belong to an elite group I call "The Faithful Finisher". UFOs (Un-Finished Objects) is what I used to call my closet projects, those that were stored there only to be forgotten for months, years even. I much prefer the term WIP (work in progress); it seems less harsh. I've started to tackle some of those "monsters" in my closet last week. Reminiscence was started in 2000!! YIKES! It's time to get back to the sashings; all the little 9patches are done, they just need to be sewn together. But it'll be far from over once they're sewn to the applique blocks. The outside borders have lots of applique and these are not done either! In my defense, the years 2000 & 2001 were tumultuous years for our family with several moves, so getting some needle-turn appliqueing done was my way of relaxing and working out some problems and coming up with solutions. Does sewing give you that "space" in your mind where you can fix any problem that comes your way?? 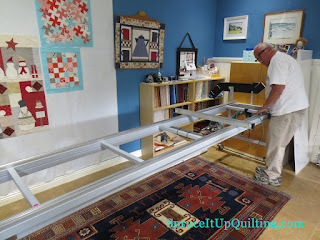 I once told my husband that if he sees me at the sewing machine for long periods of time, this means I'm working on something that is bothering me and to let me be until I solve it! Must be that I finally worked out what bugged me in 2001 because this quilt went to the closet!! Or was it that I started working again and didn't have as much time?? Whatever the reason, this is a WIP, no longer a UFO, and I need to get it finished. When you do laundry, do you hang your clothes out to dry or do you use the dryer?? I grew up with a grandmother, a mother, and aunts who used a clothesline. 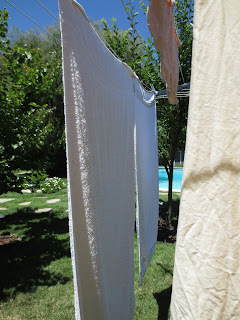 there seemed to be clothes on the line everyday even in winter! You can even see clothespins in this picture! I remember all the cats that grew up with us... Our cats were all barn cats... few of them were allowed inside! I remember... 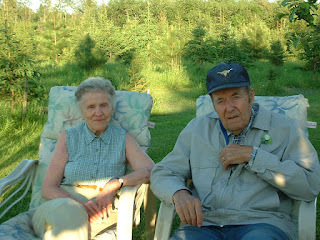 Mom and Dad and the love they had for all of us. How lucky we've been to have had such beautiful parents! It will be hard to empty the old homestead to let the new owner create her own memories but these are the memories I revisit every time I bring in clothes off the line! And the smell of home and its memories never die! 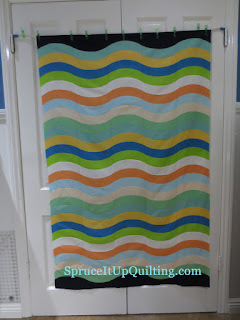 Kathy from Tamarack Shack has just blogged about my Smokey River... a quilt I made for our biking friends! T&F wanted this quilt to fit their bed so I had to improvise to make it fit their specs. It took a few weeks to complete but I'm thrilled with the results. The quilt and its backing barely fit the floor space in our bedroom! The backing is pieced from the yardage! Kathy's quilting is superb! She was so generous in putting Smokey on her very busy schedule before she breaks for summer vacation. 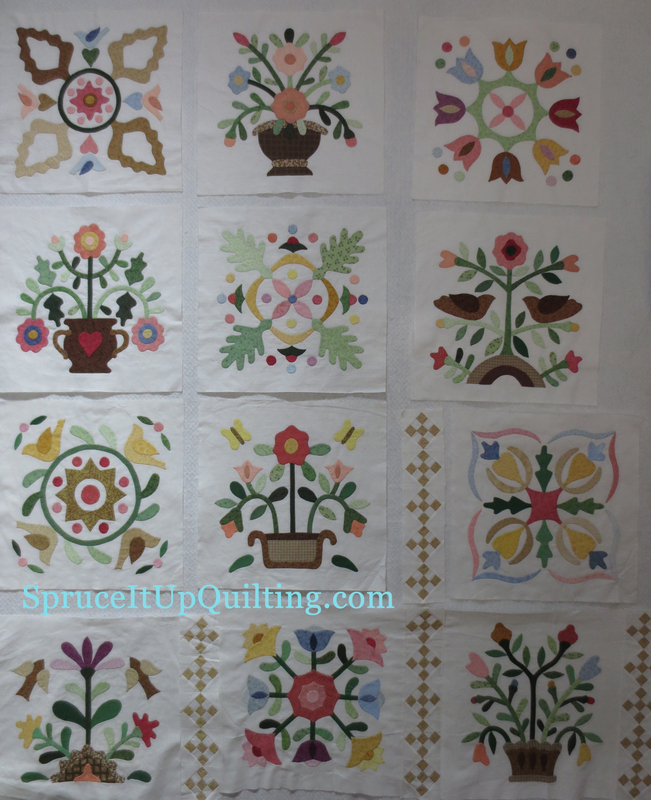 I've been following her blog from behind the scenes for a long time and have admired her beautiful quilting as well as her photography! Have you seen where/how she photographs her quilts in winter??? AMAZING shots!!! Head on over to Tamarack Shack to see it!!! Isn't it beautiful?? Thank you Kathy... there's no way this BIG quilt would have fit my machine... You are my inspiration! And my lifesaver! I hope someday to be a smidgen as great a longarmer as you! 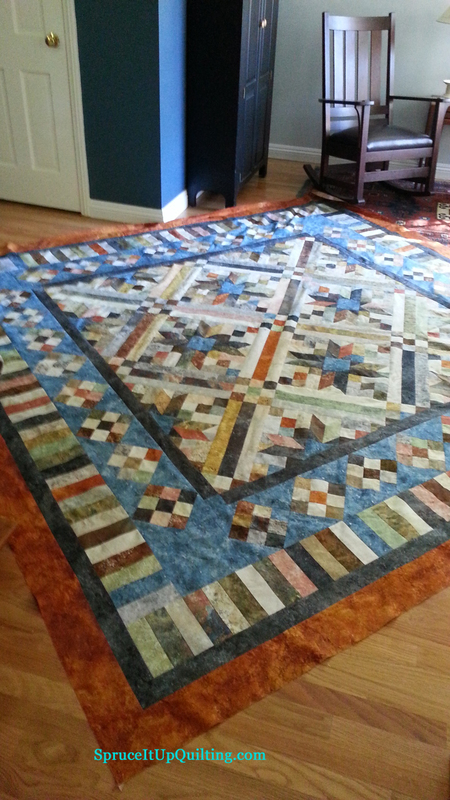 I joined this BOM from Quilty Pleasures at our guild's quilt show in May. 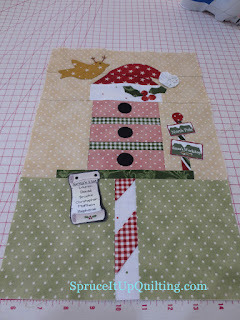 It's called Peppermint Place, a pattern by The Quilt Company from San Diego CA. 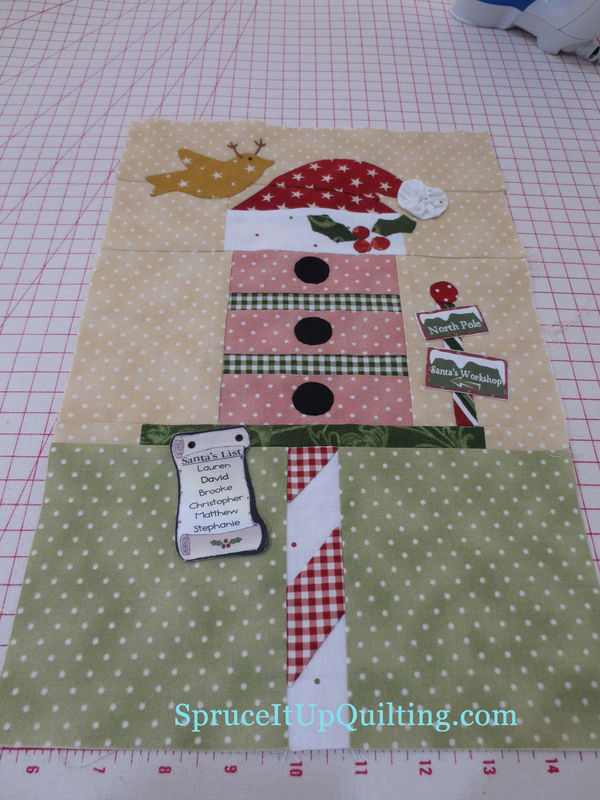 I fell in love with the colors and the fact that it's a Christmas-themed quilt didn't hurt. Block no 2 is ready for its applique. I used to do needle-turn but not anymore! 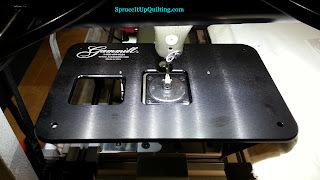 I have a secret little tool that makes turning all those small 1/8" to 1/4" edges a breeze!! NO KIDDING!! 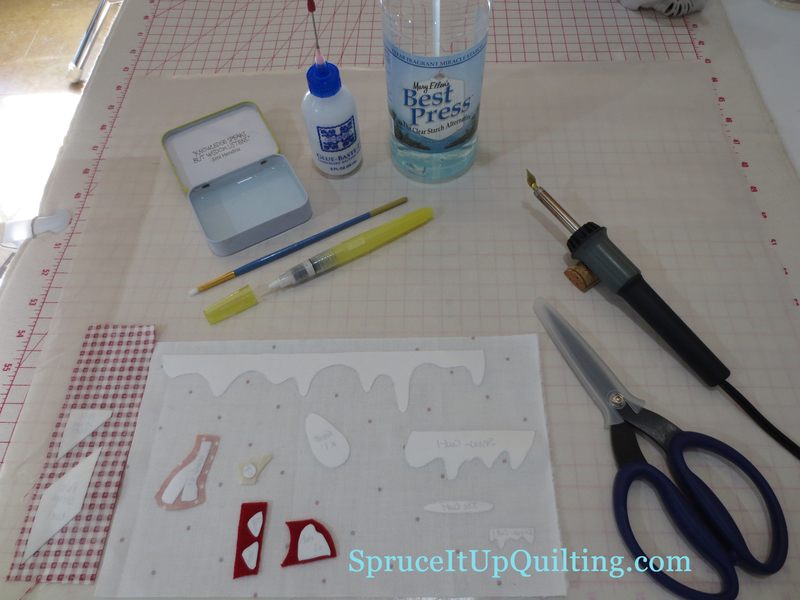 These are my favorite supplies for applique. They make life sooo simple. 1: the non-stick, heat-resistant pressing sheet is a must. I love this large surface 18x20" as it helps me spread my pieces out once they're cut and it allows them to cool after the edges have been "ironed". 2: Best Press in my favorite scent! Love the smell of this starch. 3: Freezer paper: double thickness is key here. 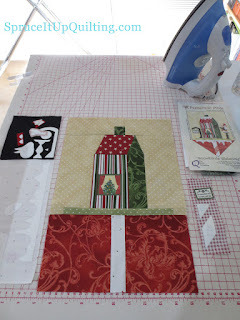 6: Glue Baste It: you apply small dots of glue to anchor your applique to the background eliminating the need for pins! 7: Your regular iron: You gently iron the glue dots applique to the background without steam and a low to med setting. 8: Perfect Scissors: these are by Karen Kay Buckley and a must for fine detail cutting. 9: and lastly, my secret weapon! THIS LITTLE TIP!! It's from Cheri Meineke-Johnson of Cheri's Crystals and costs $2.00. It fits the BeJeweler, a tool that applies Hot-Fix Crystals, Pearls and Metals and RhineStuds. 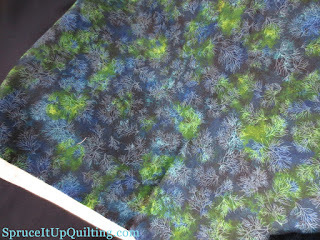 I bought this hot-fix iron kit and some crystals from Cheri at Road to California Quilt show many years ago. She sells her own Cool Tool for $18.95 which is the same as the BeJeweler. 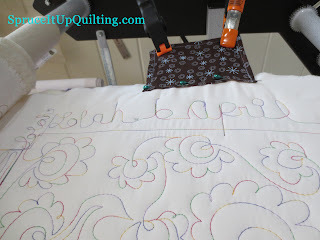 Last fall, I happened to watch a video of hers (@ The Quilting School) where she explains how she does her freezer paper applique and described her little tool. I met her at Road again in January and bought one to try it out! I was hooked! You see, this little tool's shape is what makes rolling the edges sooo easy and fast and the fact that it's hot helps dry the starched edges in place. Since I bought that applique tip for my BeJeweler, I have made two applique quilt tops: The Night Before Christmas and Merry Merry Snowmen by Bunny Hill Designs. Each top took 5 weeks to complete, amazing only because this little tip made applique sooo much simpler and faster. Give it a try... you won't be disappointed! 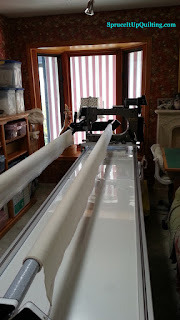 Last week, I finally got down to trying the Quick Curve Ruler by Jenny Pedigo at Sew Kind of Wonderful that I purchased several months ago. 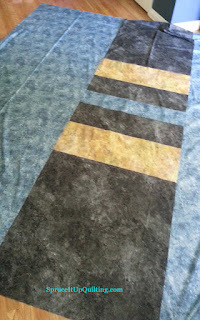 I wanted to make the Metro Waves quilt and thought I could just cut out the pieces and start sewing. From 1/2 yd, I cut out 2 strips 8 1/2" wide in each of 9 colors of Kona Solids. I LOVE Kona Solids! 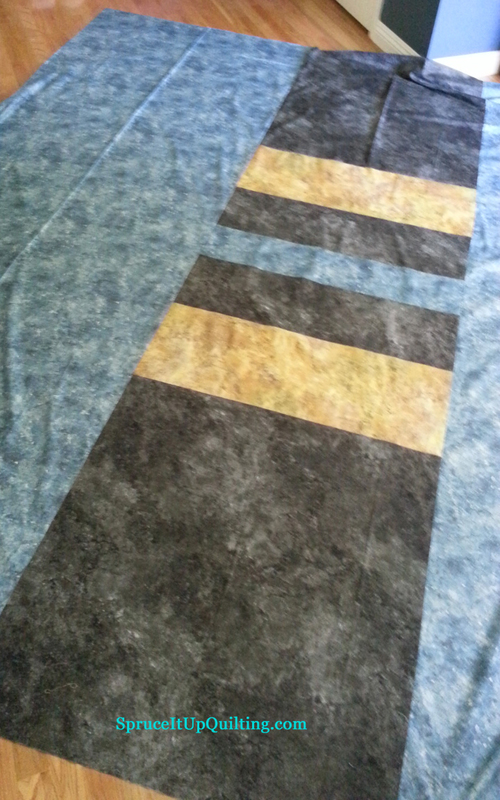 Then I subcut each strip into 2 1/2" curved pieces and set out to sew them together. After watching her video on cutting and sewing, I quickly realized that her pattern must have more parts than just these curved pieces! So I ordered the pattern. Her pattern is so well explained and has great illustrations both for cutting and sewing. BUT... 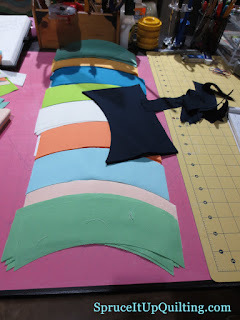 I had already cut out all the fabric! What to do?? I decided to wing it and sew what I had cut and forget trying to fix my mistake. It took a lot of pinning! I'm not as brave nor as skilled as Jenny is to sew these curves without pinning. AND I didn't want to have to trim these later either so I tried to be as precise as I could. 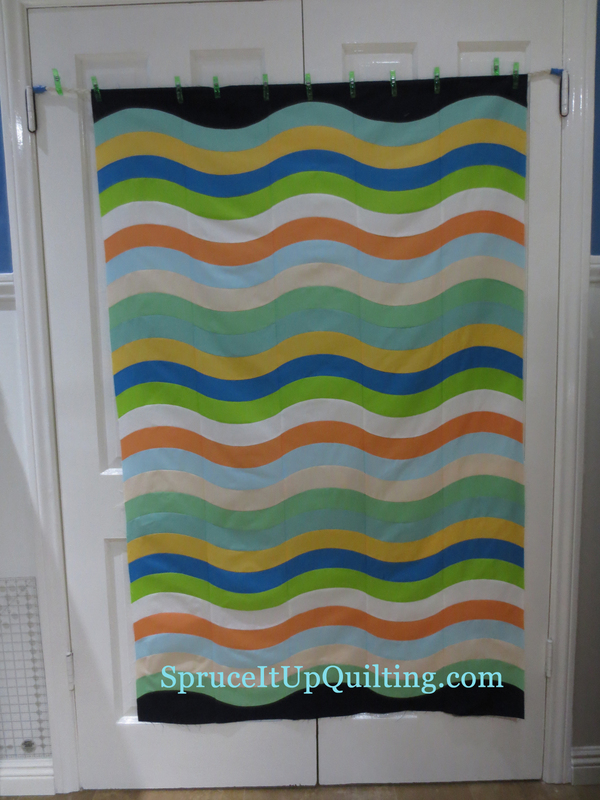 Jenny sewed her Metro Waves strips all facing the same direction which is beautiful! I wanted the strips to be waving! I have the side borders (another beautiful Kona Solid in Indigo) to add then it'll be ready for Lolah! Have you met Lolah? You will soon! I chose this Robert Kaufman Fusions for the backing. It's luscious! This little quilt will measure 48"X64"... a great lap quilt! Now time to get back to the sewing room!